On the one hand, it brings new and persuasive arguments to bear against the erroneous thesis that the recent financial crisis is merely due to human mistakes and to a number of 'government failures'. On the other hand, the book invites us to remember that economics is inextricably a part of ethics, since humans are not isolated islands of exchange; rather, they live, work and thrive in social settings. It is this consideration that brings Maria Pereira to take as her intellectual beryllo the ethics of virtue. Pereira's jargon-free book will capture the attention of anyone seriously interested in the future of our market systems." "It was truly a treat to read Money, Love, and Virtue. For nearly fifty years I have been doing psychological research examining empirically many of the issue addressed by Maria José Pereira in her book, and our conclusions are quite sympatico. What I found so gratifying about the book is that a banker—someone who worked for many years inside the system—has argued persuasively for many points that I, as an outsider, have believed to be true for years. I happily recommend the book, especially to people who believe it is time to make significant changes in the banking industry." "Maria José Pereira is a former banker with considerable experience of the money markets and the changing banking culture in the Far East as well as in London and New York. She writes lucidly and with great authority about the missing connections between banking, markets, virtue, and, above all, love. means to reinforcing citizenship, for establishing collective responsibility, for promoting compassion, and for humans to become a “living entity.” She turns to Aristotle to understand that virtue is a joyful process of self-realization over love, leading to justice (or proportionality of action) and frugality (or sufficiency of consumption), and of enabling others to live well. from money are damaging and distorting of minds and markets. A false sense of continuous profitability creates unstable indebtedness... For anyone interested in understanding why there is still a financial crisis (though muffled and partially concealed by bankers and politicians) and why the calls for both social justice and ecological restoration through the reformed social market place remain unheeded, even when issued by Nobel Laureates, Pereira’s analysis is essential reading. ...This book should be the first on any MBA reading list, and indeed on any course reading list." "...The book zeroes in on one aspect of traditional and historical economic thought in particular; the need for the power of markets and finance to be accompanied by a strong sense of social justice. Money is a tool, and from the Greek philosophers onwards its power to advance the welfare of society has been widely recognised. But its destructive power has also been fully understood, and the ancients always cautioned that the tool must be used wisely, fairly and above all justly. It is when money moves from being a tool under man’s command to a god that commands men’s minds that its dangerous side emerges, and Pereira’s assertion is that whenever this happens, whenever man seeks money not for what it can do to further social justice but merely for what it is in itself, then society suffers. This book will not be comfortable reading for many in finance today. But because of finance’s urgent need to rebuild its relationship with society, it is all the more necessary that it be widely read." John Nugée, retired central banker – (Bank of England and Hong Kong Monetary Authority). "The strength and timeliness of this book is that it invites readers to reflect not only on our systems, but also on the quality of the human beings lying behind them and inviting a new view of human possibilities. [The author] suggests that inner motivation stems from compassion or love, that a flourishing life will permit a humanistic society and that the organising principles of such a society are ‘friendship or reciprocity, consideration and collaboration, with the human being at the centre’ in terms of real liberty. Science shows us to be part of an interconnected world, which should encourage us to develop corresponding social systems - education in this direction will need to become part of standard university courses. " "... Money, Love and Virtue, is required reading for our master’s students. Pereira's perspective as a banker puts her in a unique position to look critically at what has happened to our way of thinking about finance. ...Perhaps the most important message Pereira makes is that social responsibility is spurred on by individual responsibility. For social contracts and ethical guidelines to work well, individuals must behave responsibly. Thus said, Pereira gives us a place to start in addition to much to think about. A must read for young professionals as they enter the work force. A refreshingly balanced discussion for anyone interested in seeing social justice return to prominence in the business model…"
"Maria Pereira is re-imagining the world of finance and economics in her very thoughtful book of reflections. At a time when people have been deeply hurt by those wielding financial strength combined with a severe lack of morals or respect for the Other, she brings soul to the business of finance, without which we lose our humanity. Her work is a call to awaken to the greed of the system as it has become, and what the love of money for money's sake has done to us. We must re-imagine a more just world in which virtue and fairness are held as ideals for which to strive. This re-imagining requires awareness of our current plight, reflection, and contemplation/meditation. " "The hallmark of a good book is that it pushes, prods and provokes one's thinking. Money, Love and Virtue does this and does subtly and indirectly, without being aggressive or didactic about it. It provides the background,it outlines the author's views as a set of personal 'reflections' but it then leaves the rest up to the reader who cannot but help ask some obvious questions, such as: why has finance and economics become so mathematical as to become abstract? Why has finance become unhinged from the everyday world and from business? Why have morals and ethics taken a back seat? What could be done to accelerate the process of moving towards a more humanistic society? This is not a book to pick up for some light reading! It requires and deserves to be read and digested slowly so as to allow time for reflection. And for those who are willing to be challenged and to dedicate the time and attention, the investment will be rewarding!" "an impressive, well-researched clear articulation of key economic and social issues confronting all of us. Pereira, a former banker, develops a strong case that we all need to alter our thinking and move away from near-singular focus on profit and gain without regard for consequences impacting society as a whole. ... Money, Love and Virtue can serve as a valuable beacon, shedding light on the direction we need to take as we navigate the rising tide of dissatisfaction that is washing over the country." "For anyone concerned with how our financial systems can be reformed to enhance the wellbeing of the global human community Money, Love and Virtue, is a wonderful resource. ... The range of material she has assembled from writers since the earliest time of Western civilisation creates a book that can be dipped into again and again, and shows that we can hold a practical vision for putting money in the service of our highest aspirations." "Maria Pereira, a former banker and investment professional, has just released a remarkable new book... the result of a personal inquiry dating back to before the crash into how the undoubted power of our financial systems can be harnessed to feed life rather than corrupt it. Her book explores how money has bred ‘finance’ which in turn has taken its place in a narrow view of economy and economics. She then returns to the philosophical heart of the matter in considering how we might restore virtue, the common good and love as the ‘infinite resource’ at the centre of our economics and our financial systems – a new humanism. The book is a treasure trove of deep reflection from someone who has lived at the centre of the system she seeks to renew. It is already stirring a new conversation in her diverse communities of influence." 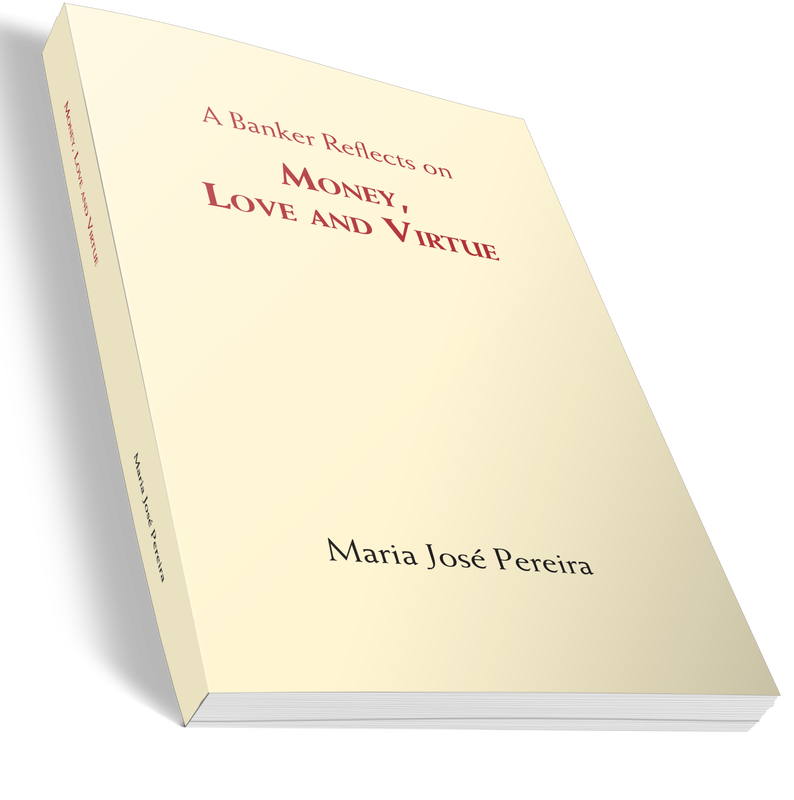 Money, Love and Virtue is written in a lively and accessible style which avoids all financial jargon and political rhetoric. From the world of high tech and high frequency trading it brings us back to basics of what it means to be human. Give yourself the day off, find a peaceful spot, and read this book!"